Where once industrial winemaking and grapegrowing held sway, there's now an unabashed pride in the natural gifts of the Chilean land. It's all helping to recharge and redefine this winemaking dynamo. Watch our video preview of the Chile cover story, as well as a preview of the Trentino-Alto Adige feature of the issue. 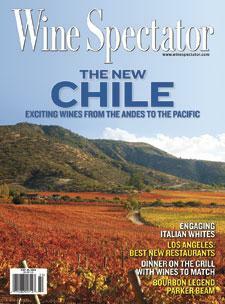 Chile: A free chart offers an alphabetical list of all Chilean wines reviewed for the tasting report in this issue. Trentino-Alto Adige: A free chart offers an alphabetical list of all Trentino-Alto Adige wines reviewed for the tasting report in this issue. Self-Made Man - The drive and passion of vintner Aurelio Montes, "guardian of the spirit"
WineSpectator.com: More than 350 wines were reviewed for this report. A free alphabetical list is available. WineSpectator.com members can access complete reviews for all the wines tasted using the online Wine Ratings Search. WineSpectator.com: BONUS VIDEO Hunting for Terroir in Chile's Apalta Vineyard: Pedro Parra likes digging holes and finding the unique aspects of vineyards. In this video, we discuss the Apalta Vineyard, source of wine such as Casa Lapostolle's Bordeaux-style blend and Viña Montes' Syrah. WineSpectator.com: More than 330 wines were reviewed for this report. A free alphabetical list is available. WineSpectator.com members can access complete reviews for all the wines tasted using the online Wine Ratings Search. WineSpectator.com: BONUS VIDEO Pinot Grigio v. Friulano: Both varietals are crisp and bright, but how are these Northeast Italian natives distinct? Get the answer as Andrea Felluga of Livio Felluga joins senior editor Alison Napjus. WineSpectator.com: Find more great restaurants with award-winning wine lists in our online Restaurant Search, with nearly 3,800 dining spots. WineSpectator.com: FREE Collecting & Auctions email newsletter: Get a new collectible wine pick in each edition, plus expert tips on collecting, news and analysis. Chad Townsend's Carrot Salad with Riesling - Chad Townsend, Salt of the Earth, Pittsburgh, Pa.
SPRING ENTERTAINING Whether you're having family over for Easter, need kosher recommendations for Passover, or are honoring Mom on her special day, keep your guests happy with our editors' latest wine picks and delicious recipes from chefs who inspire us. GRAND TOUR This spring, Wine Spectator hits the road with more than 200 of the world's finest wineries, making stops in New York City (April 29), Washington, D.C. (May 1), and Las Vegas (May 3) to pour top bottles for wine lovers. If you couldn't make it, read all about it and check out the photos of who was there. In the Golan Heights: Learn about this region's vinous history and its cool-climate, high-altitude vineyards. Victor Schoenfeld, head winemaker of Golan Heights Winery in Israel, joins managing editor Kim Marcus and pours a pair of classic varietals: Chardonnay and Pinot Noir. Gaja's Italy: Angelo Gaja, who revitalized the Barbaresco appellation, and his daughter Gaia share the family's wines from Piedmont and Tuscany in this seminar. Germany's Rare Rieslings: This seminar on four sought-after dessert wines, each representing the pinnacle of quality from its region, features winemakers from St.-Urbans-Hof, Bassermann- Jordan, Schloss Johannisberg and Gunderloch. 2013 BORDEAUX BARREL TASTINGS Trying to decide on futures purchases from yet another difficult vintage for Bordeaux? Rain made the harvest challenging for the dry reds, but Sauternes and Barsac may excel. James Molesworth visited the region in late March to taste barrel samples of the young wines. Members can get his scores and tasting notes for the best reds, dry whites and sweet wines. Plus, read his on-the-scene blog posts for highlights from his visits to top châteaus. PERSONAL WINE LIST AND PERSONAL RATINGS Use our Personal Wine List tools to track your wine collection, monitor the value of your cellar and record tasting notes. You can rate the wines you've tasted, so it's easy to remember your favorites. All rated wines are automatically copied to a convenient My Wine Ratings list for future reference.